When it comes to cosmetic contact lenses, Sen One stands out with its impressive offerings in the form of La Loggia, Soiree and Classic. A first of its kind innovation, the cosmetic lenses offered by this brand, represents the perfect blend of beauty and technology. A result of the creative vision pioneered by Mr. Nader Jasser, these lenses have received an extremely positive response in the Middle Eastern markets. 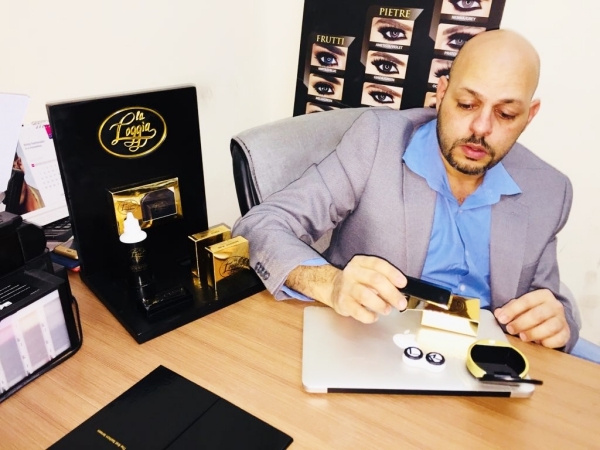 In this issue, VisionPlus talks to Mr. Jasser to understand what drives his passion for creative offerings in the domain of cosmetic lenses, the products in his portfolio and how does he plan to steer the brand ahead in the months to come. VisionPlus (VP): Tell us a few details about how did you go about the idea of establishing Sen One. Nader Jasser (NJ): SEN ONE was been established in 1988 in Abu Dhabi as a General Trading company. I remember, it all started by selling heavy duty equipment spare parts. Many years later, in 2012, I shifted the operations base to Dubai. The change in the address was one of the two big decisions that I took. Because in 2012, I also shifted the focus of my business from industrial equipment to fashion. Initially, I set up a kiosk in the mall of the Emirates. Today, we have grown to 4 full-fledged branches in the GCC region. We are planning to expand further in the UAE and internationally specifically in the GCC region. Our retail presence goes by the name LA LOGGIA, an Italian city by the same name. The concept of La Loggia comes from the word itself – which is Italian for a fine architectural gallery. True to its name, La Loggia presents its gallery of fine Italian brands of fashion. In fact, we are using the same name for our contact lenses business as well. VP: What, according to you are the differentiating factors for the range that Sen One offers? NJ: First things first, I believe our portfolio is diverse, ranging from perfumes to watches and contact lenses, we have it all. We have a dedicated team that works hard on giving our products an edge. Our products are a mix of excellent Italian quality and best in class technology. And special care is taken to design products in accordance to the taste consumers and partners in the region. VP: Tell us a little about the La Loggia contact lenses collection and the inspiration that led to its creation? NJ: La Loggia lenses are a unique product, a one of a kind. Our first appearance in the market was in September 2016 when we launched our lenses in Optifashion Boutique at the Dubai mall. In my opinion, we are the latest arrival into the market and are rapidly growing due to the renowned history of our producer Marshal Inter group, which has a long and credible lineage in the domain of contact lenses. A small yet important testament to our quality is our lenses and solution were swiftly and without any questioning, registered as well as approved by the Ministry of Health (MOH). As of now, we have two main categories in the La Loggia contact lenses family Soiree and Classic, both registered and approved by the MOH. I take pride in my team that works round the clock to create new combinations of colours for our contact lenses collection. Their efforts are directed towards ensuring that our coloured contact lenses are inspired by the colourful natural landscape around us. Needless to say, the focus is on using best in class technology to ensure comfort of the wearer. 1-Soiree: This collection is a unique addition to our portfolio. These lenses are the fruit of two years of hard work and research. Currently, they are the only lenses amongst all available brands that offer the unique concept of mixing gold glitter and colour in the lenses with no compromise on that exquisite Italian quality and craftsmanship. We have worked hard on making these lenses in a way that allows them to be used in daily life basically as fashion lenses worn for parties and other engagements. Clearly a masterpiece, that makes its wearers stand out of the crowd with elegance and class. 2- Classic: Our Classic line might seem normal, but rest assured we have worked hard to introduce unique coloured lenses with exceptional quality while maintaining a competitive price. These efforts are to ensure that all our clients have access to top quality lenses at an affordable price. VP: What is the USP of La Loggia? Is it the only brand that offers fashion contact lenses? What is the competition for the brand in the Middle East market? And how do you face it? NJ: As mentioned earlier our lenses are unique. They are the only lenses in the market offering a the unique fashion element of shine with glitter infused in them. This is just one of the many features that make our lenses a preferred choice for many customers. VP: La Loggia contact lenses were also a part of Vision-X VP Awards in 2017. How would you rate that experience? Is Middle East a market for cosmetic contact lenses? NJ: We are very pleased with the results of the Vision-X VP awards. As you are aware, the evaluation criteria in these awards was extremely thorough in an effort to ensure unbiased decisions. We had also participated in these awards. Our products were evaluated on various parameters. Two of our products made it to the final shortlist. While we didn’t win, being shortlisted against such tough competition already says a lot about our products and customer loyalty. We would like to take this opportunity to congratulate Fresh Look for emerging as winners. I do believe that the markets in Middle East have a huge potential to emerge as the hub for cosmetic lenses and therefore I am confident that our products will do really well. VP: You seemed to have successfully raised the bar for fashion contact lenses with collections like Soiree. Tell us more about the options in this collection and how are they foraying in markets? NJ: Yes, we have raised the bar in the fashion contact lenses market, as our Soiree collection is like no other. We have researched the market and invested efforts to understand what our customers want. Accordingly, we have created our combinations and set our prices to make it available to our clients. At the core of our efforts is an endeavour to give the people what they want and deserve, unmatched quality and style without over pricing our products. Our current collection in Soiree has 6 glamorous glitter infused colours while our classic range has twelve outstanding and natural looking colours. In fact customers can see our collection and even order on www.laloggia.store. VP: In your opinion, what are the challenges that you as a cosmetic lens company need to tackle in the coming months? NJ: In my opinion, as a company working with cosmetic lenses, people need to understand that we face several challenges. on one hand we face the cosmetic beauty challenge in which our product must be aesthetically appealing and flawless. On the other hand, we are dealing with a very sensitive part of the human body, the eyes. Also, the aesthetics our products need to meet certain requirements to be suitable for daily use without having any sort of negative side effect on the eye. Thankfully we have been able to achieve the goal. All our lenses are approved by MOH, which means they have passed several tests and requirements set by the ministry making them safe to use. We do believe, as a company and as an individual we need to make sure the products are safe and do not harm customers. VP: How do you plan to expand the network of Sen One in the surrounding region? NJ: Our plan for expansion in the region involves partnerships and growing our franchisee network. We are currently open to discuss with potential investors who are willing to work closely with us to expand our brand to other areas within the GCC and even markets around the world. VP: What is your take on the evolution of online optical trade, do you think that it poses a threat to the traditional business setup? NJ: Not really, I personally believe that it helps expand the trade and makes it easier for consumers to find what they are looking for without having to settle for what is available in their local markets. Having said that, the people must also be made aware that some online sales and offers are too good to be true! I remember a saying that a close friend of mine once told me “if it is too good to be true, then it most probably is not true!”. Worst is that he said this after a famous incident on an online trading platform where a person bought a gaming console for 1 USD but upon delivery was shocked to receive a picture of the console instead! I am not saying that this will always be the case but the risk does exist. Also, the wrong information / offers available on the online platform pose an unfair threat to the legitimate businesses and retailers who offer genuine high-quality products. After all, it is also not fair for customers who often pay a handsome amount and end up getting duped. Additionally, when it is something as sensitive as lenses, there is a high risk of the eyes being damaged. VP: Any collections in the pipeline that you would like to share with our readers? NJ: We are constantly working on new collections and colours. we are currently working on a new collection in soiree and classic for light eyes. we hope once they are ready and available they will meet our customers’ expectations from us and we will always work to please our customers. VP: Any message for our readers – which they need to pass on to the consumer? NJ: Yes, through your magazine, I would like to share with our opticians that we care about their customers and always have them in mind! We always want what is best for them. I would also urge my optician friends to encourage their customers to be aware of the do’s and don’ts of lenses. I believe that awareness about the use of lenses, how to maintain the hygiene, etc. is very low. Given the fact that the lenses come in direct contact with our eyes, it is important to invest efforts in keeping oneself updated with such information.